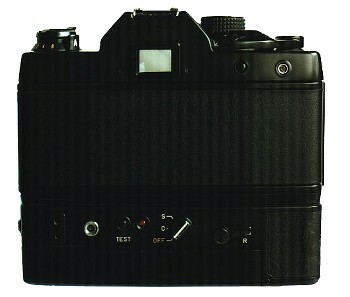 TYPE: 35mm SLR featuring electronically controlled Auto/Manual exposure, focal plane shutter. IMAGE SIZE: 24mm x 36mm. 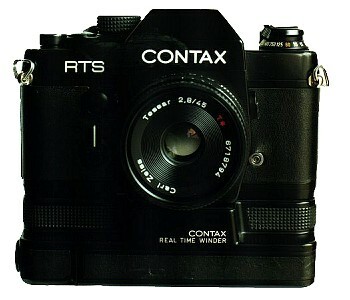 LENS MOUNT: Contax/Yashica mount. Does not make use of MM lens shutter priority. SHUTTER: Electronic focal-plane, horizontal-travel cloth. sec. to 1/2000th and B.
SYNCH TERMINALS: Direct X and synch terminal. SELF TIMER: Mechanical self-timer with 10 sec. delay. EXPOSURE CONTROL: TTL center-weighted metering at full aperture using SPD (silicon photo diode). EV range -1 to 19 at ASA 100. ASA film range 12 to 3200. AUTO FLASH CONTROL: None. Synch speed 1/60th sec. EXPOSURE CHECK BUTTON: Pressing front button activates LED display for 16 sec. EXPOSURE COMPENSATION: +2 EV ~ -2 EV via exposure compensation dial. 1/2 stop clicks using unusual system of x4 to x1/4. X4 means "times 4" or 2 stops. FOCUSING SCREENS: Micro-prism standard - six others available. VIEWFINDER DISPLAY: 16 LED shutter speed display shows speeds. Green shutter speed pointer overlaps "A" setting on Auto and indicates shutter setting on manual. Aperture display shows max. aperture of the lens in use on extreme right and f-stop in use in green figure. Exposure compensation tab appears when the exposure compensation pointer is set at any position except X1. 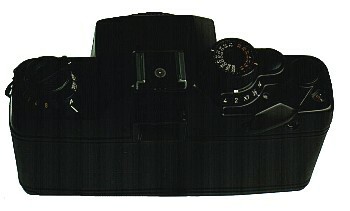 FILM ADVANCE: With full stroke of 140 degree setting angle, or several short strokes. Features film feed indicator and automatic winding capability with motor drive or winder. FILM REWIND: Film rewind crank-handle with clutch action, and film rewind release button. MULTIPLE EXPOSURES: Depression of the film rewind button on bottom. ACCESSORY SHOE: Direct X contact only. CAMERA BACK: Opens by pulling film rewind knob all the way out. Provided with memo holder. Removable. DEPTH-OF-FIELD PREVIEW BUTTON: Button type. POWER SOURCE: 6.2v silver-oxide battery(544 or PX28), or 6v alkaline-manganese 4LR44. Switched. BATTERY CHECK: Indicated via steady or pulsating pattern of LED display in the viewfinder. OTHER FEATURES: Provided with couplings for motor drive and winder, and with LED for Data Back. SIZE AND WEIGHT: 142mm x 89.5mm x 50mm. 700 grams without battery.